It is still winter in the northern hemisphere of Mars. On April 20, 2000, the Mars Orbiter Camera (MOC) onboard Mars Global Sureyor (MGS) captured this view of a chilly Lomonosov Crater. The rims of the crater appear white because they are covered with wintertime frost. A dark patch just right of center on the crater floor is a sand dune field. 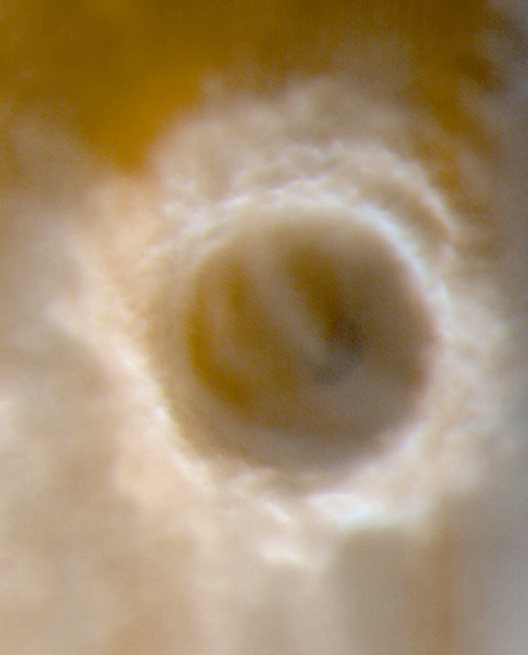 Both low-lying ground fogs (fuzzy, patchy areas around the lower perimeter of the crater) and higher cloud layers (fuzzy white arcs seen within the crater and towards the upper right) obscure much of the surface. The sun, only 12° above the horizon, bathes the scene in a reddish-brown hue. Lomonosov Crater is about 150 km (93 mi) across and located on the martian northern plains at 64.8° N, 8.8° W. The crater is named for the 18th Century Russian chemist, Mikhail V. Lomonosov (1711-1765). Spring will arrive in the martian northern hemisphere around June 1, 2000, and summer will come in December 2000. Sunlight illuminates this scene from the lower left.